In a joint study with GBTA, RoomIt has identified a number of gaps that exist between travel buyers and travelers. 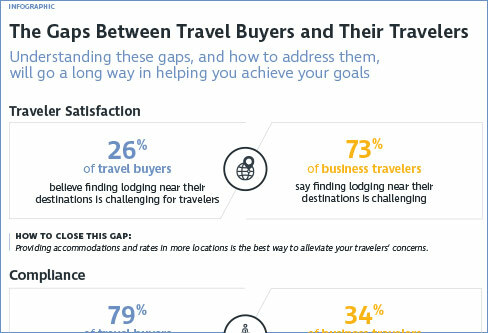 These gaps help explain why travel buyers struggle with improving traveler satisfaction, increasing compliance and reducing costs in their hotel programs. View the infographic to learn what these gaps are and how to close them. To reach out to RoomIt to learn more and also receive communications on our products and services, please complete the form below. You can unsubscribe at any point in the future from our mailing list using the 'unsubscribe' link on any of our emails. Please review your selected entries and submit again. Thank you for your interest in RoomIt.